The new public Square includes a water fountain, an interactive art commission and atmospheric lighting, providing a fun and interactive space for the public to enjoy while trees, soft landscaping and a new lawned area create a relaxing informal space. The work at Southwater Square and the construction of the new Travelodge Hotel started last June and has been completed by local construction firm McPhillips who employ 70% of their workforce from within a 10 mile radius of Telford. The water fountain was one of the most popular design features to form part of the new square, chosen as a desirable feature by over 50% of those who completed a public consultation survey back in July 2016. Other highly desirable features included public art, lighting and additional seating. The water fountain compose of 25 water jets and there will be hourly displays during the day. The water jets also feature lights which will transform the space after dark and can also be programmed with colours for special occasions and events. The interactive art commissions titled ‘Aspect’ change colour in certain lighting conditions creating a giant sized colour filter providing lots of photo opportunities for visitors. The commission also creates a window to view the Square and Lake providing different perspectives, colours and making everyone’s experience different. There will be 9 art installations located within the public space which will be a visual spectacle for those visiting the area. The gold coloured lighting wands that have been installed within the square represent 5 decades of Telford. These wands will display different colours throughout the evening which mirror the colours displayed on Southwater One creating a Zen like ambiance within the area on an evening. 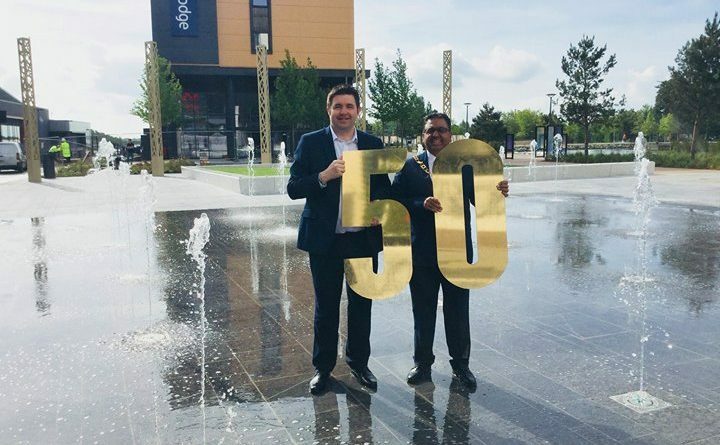 Council Leader Shaun Davies said: “The new Southwater Square is a fantastic new public open space that connects our award winning Town Park with Southwater and sets the scene for more events and activities in Southwater. “We are proud of this great space, that also our residents, visitors and stakeholders helped to shape and that they can enjoy from now on with their family and friends. 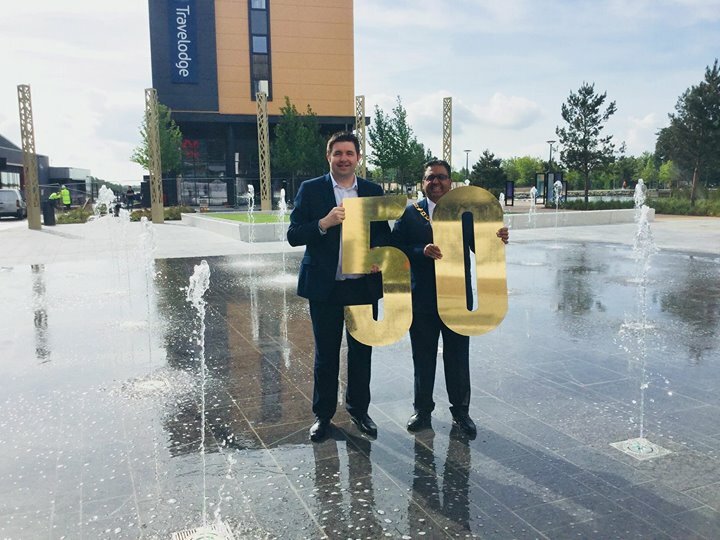 “The Southwater Square opening marks another significant milestone in Southwater’s development that is likely not only to increase the number of visitors – raising Telford’s profile as a major regional destination – but also to attract more businesses, with positive impact for the local economy”. The design of the Square was shaped by the views of more than 600 people who put forward their ideas on how they would use the space and what features and events they would like to see in this space.